(Bloomberg) -- New York Senator Kirsten Gillibrand raised $3 million in the first quarter of 2019 for her Democratic presidential bid, with the average online donor pitching in $25, according to figures released by her campaign. The total is less than the $4.4 million Gillibrand raised in the first quarter of 2017 as she sought re-election to the Senate. The campaign has $10.2 million, according to spokeswoman Meredith Kelly. Candidates can transfer money raised for congressional elections to their presidential campaigns. Gillibrand had $10.3 million in her Senate account at the end of 2018. Kelly tweeted that 92 percent of Gillibrand’s donors gave less than $200 and that almost two-thirds were women. The majority of donors had never given to Gillibrand before, and educators were the largest group of contributors, Kelly said. 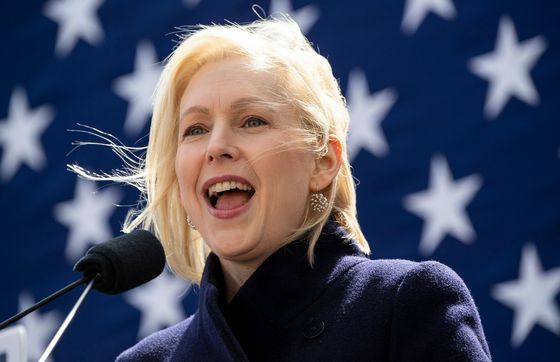 Gillibrand’s haul puts her behind several others in the top tier of candidates seeking the 2020 Democratic nomination. Senator Bernie Sanders of Vermont, the current front-runner in polls among declared candidates, reported raising $18.2 million for his presidential bid in the year’s first three months, while former Texas Congressman Beto O’Rourke said he raised $9.4 million in just 18 days following his campaign announcement in March. Gillibrand trailed the three other senators in the race as well. The campaign of Elizabeth Warren of Massachusetts said she had raised $6 million, while Minnesota’s Amy Klobuchar raised $5.2 million and Cory Booker of New Jersey took in more than $5 million. The reported totals for individual candidates are less than the $25 million that Barack Obama raised during the first quarter of 2007 during his run for the presidency. That score immediately added credibility to the campaign of a man who was then the junior senator from Illinois, in a race with fewer candidates competing than the 18 who are running so far for 2020. The first-quarter numbers offer early evidence of who is generating excitement among the party’s grassroots donors at a time Democrats are placing increasing emphasis on collecting cash from sources other than big donors and corporate political action committees. The candidates must report first-quarter fundraising and spending to the Federal Election Commission by the end of Monday, but individual campaigns often announce collections shortly ahead of the deadline to try to showcase their support. Some likely candidates, including former Vice President Joe Biden, may have delayed their entry into the race until after the end of March so that they could avoid the expectations associated with the first-quarter fundraising. Biden has told friends he’s likely to announce a bid later this month. “With millions raised and over $10 million in the bank, Kirsten is in a stronger financial position than the vast majority of the candidates in the field,” Kelly said in a statement. Gillibrand has said she is not accepting money from corporate PACs and federal lobbyists for her presidential campaign.